In 2013, the global beverage market was worth approximately $840.6 billion. Some of the major companies in this industry are The Coca-Cola Company, PepsiCo, Inc., Dr. Pepper Snapple Group, Inc., Green Mountain Keurig, and Monster Beverage Corporation. The largest types of drinks sold were carbonated soft drinks, the second biggest were fruit or vegetable juices and the third was bottled water. The beverage industry will always have a high consumer demand for products. Due to this constant demand, there remains a large amount of competition between companies. New products are always being developed to appeal to consumers. New types of drinks, new flavors, improved packaging and bottle shapes are always changing and being introduced. Businesses have noticed the decrease in the amount of soda that the population is consuming. Several reasons for this decline may be caused by the increase in the fight against obesity, along with the support of soda taxes. In response, soft drink companies have been manufacturing smaller sized cans for their customers. Companies believe that the idea of smaller cans will be a better option for people who don’t want to drink as much sugar. Major companies, such as The Coca-Cola Company and PepsiCo, Inc., have participated in producing smaller cans and bottles. For example, Coca-Cola has made many of its cans smaller and cheaper, acknowledging consumer demands for a healthier diet and lower prices. introduced nationally as an alternative to 20-ounce bottles. It will also cut the retail price on its recently introduced eight-pack of 7.5-ounce Coke "mini'' cans by approximately 20% to $2.99 in order to try and attract more customers. The Coca-Cola Company of Atlanta, Georgia has been using a machine called Freestyle to offer consumers the option to create their own drinks. Coca-Cola’s Freestyle machine can be seen in popular locations, such as Moe’s Southwest Grill and Burger King. The machine allows users to choose from any kind of soft drink and mix it with different types of flavors. This technology gives consumers an interactive approach to customize their own product. PepsiCo, Inc. based in Purchase, New York has increased competition with Coke by creating a similar machine, known as Spire. Both of the machines have a touch screen and have the same customizing process. Pepsi has actually been more successful with marketing their machine due to its smaller size and cheaper flavor cartridge system. These aspects make it more appealing for consumers to buy, such as restaurants and cafeterias. Spire even has the ability to track what soda brands and flavors consumers choose to gather data. This data gives the company more insight on what consumers want and what drinks or flavors are in high demand. ZICO Beverages, LLC headquartered in El Segundo, California is a well known company in the beverage industry who is known for producing coconut water. They have created a new line of coconut water that contains juice blends called ZICO Chilled Juice. These products are aimed for consumers who want to be healthy, but at the same time don’t want to sacrifice taste. Buyers can choose from three flavors of natural, orange and pineapple mango. These beverages include ingredients of not from concentrate coconut water and fruit juice. Each drink has five electrolytes and provides 50% of fewer calories than normal juices. Many people are moving towards healthier drink options and ZICO is providing them with a healthy and great tasting alternative. Keurig Green Mountain Inc. is a successful company from Reading, Massachusetts who is known for their Keurig Hot and Keurig Kold systems. The company is constantly coming up with numerous innovations to expand their product line. A main reason behind the company’s success is because they design every part of their products themselves. The process includes designing the brewer, pods, the beverage in the pod and several other elements of the Keurig system. Their system has a flexible platform, which offers users the ability to produce a variety of beverages. Keurig machines can brew coffee, tea, fruit drinks and hot chocolate. Keurig hot is accessible to use with 75 different brands, which gives people the option to stock up on multiple beverage choices. Keurig Kold allows individuals to make cold carbonated drinks without having to refill the beverages with CO2. This machine makes the process of making your own carbonated drinks easy. Keurig products have been successful due to the simple access of multiple types of beverages for consumers in the comfort of their homes. Bolthouse Farms Inc. has invested in research and development to advance their company in the beverage industry. During the past five years, there has been a 75% increase in their R&D team in addition to the growth of market research. Modern technology consisting of high-pressure processing (HPP) and ultra-high temperature pasteurization is utilized by the company. Research and development occurs in the Innovation Center located in Bakersfield, California, which includes R&D labs, sensory labs, a culinary kitchen and pilot plant. All of these advancements have led to 21 new beverages and the creation of its ultra premium juice, known as 1915. One of the unique beverages the R&D team recently created is Blueberry Banana Almond Milk, which has received a positive response from buyers. The 1915 juice became a finished product within 12 months. This product line consists of five unique flavors, including Green, Carrot, Beet, Tropical and Berry. They are all manufactured by the method of high-pressure processing. These juices are organic, have no GMOs and no added flavors, which is appealing to those who are health conscious. Bolthouse Farms has largely invested in their R&D and as a result the company has grown in its industry. Headquartered in Camden, New Jersey, Campbell’s has been involved with recent innovation activities to enhance their company’s products. The brand is trying to create products that offer buyers a healthier and more convenient option. They have conducted studies and researched consumer activity, including beverage consumption trends. Campbell’s discovered that people are buying healthier products with expenses of healthy products totaling over $2.2 billion in the United States. These studies provided the company with information to develop drinks that customers will want to continue purchasing. Since these studies, several new beverages have been created for the Campbell owned V8 line, including, Splash, Veggie Blends, Protein Shakes and Infused Waters. V8 Splash is offered in Lemonade and Strawberry Lemonade flavors. This drink was developed due to the discovery that lemonade flavors are one of the most popular juice flavors for consumers. V8 Veggie Blends were created based on consumers desire to be healthy. Veggie Blends offer people the choice to receive their intake of nutrients all in one beverage. V8 Protein Shakes were developed with the thought in mind that 33% of people eat snacks instead of an actual meal when they are traveling. These shakes offer a filling and nourishing alternative for people when they don’t have time to sit down and eat a full meal. The V8 Infused Water line presents buyers with additional options of drinking water. The drink contains a low amount of calories, while offering unique water flavors. Lost Spirits Technology is an engineering based company from California that has discovered a new method of creating aged spirits within a couple of days. Their development has changed the alcoholic beverage industry because spirits usually take years to create. It took the company five years to finalize the process. They are the first company to design the closest chemical reactor, THEA One, in comparison to real chemical signatures utilized to make aged spirits. Utilizing the new chemical reactor allows spirits to be produced within six days compared to several years. Forensic chemistry, gas chromatography/ mass spectrometry (GCMS) and direct injection mass spectrometric (DIMS) are techniques that are used during the chemical process. This new technology allows consumers to enjoy high quality beverages at a lower price. 3M Food Safety has produced the 3M Petrifilm Aqua Plates which uses food microbiology to test the quality of bottled water during manufacturing. This technology tests each product for harmful contaminates, including heterotrophic count, coliform, enterobacteriaceae and yeast and mold. This process is conducted with the use of a water soluble gelling agent, nutrients and indicators. The Petrifilm Aqua Plates has shown to assist companies in cutting down costs and saving production time. 3M Food Safety developed efficient technology, which examines the quality and safety of products to ensure they are ready for distribution. LifeFuels of Reston, Virginia has created a smart water bottle that tracks and provides users with nutrition and hydration information. The company has created a unique bottle that differentiates itself from regular water bottles. Specifically, the smart technology keeps track of how many vitamins and minerals are consumed by a user. The 18 ounce bottle was designed to integrate a FuelPod dispenser within the bottle and a LCD-screen located on the exterior. The dispenser supports up to five FuelPods, which consist of vitamin, mineral, supplement and flavor pods. These FuelPods are long lasting compared to other products because it offers multiple servings in one pod. Several companies, including EBoost and H2WOW, have partnered with LifeFuels to create new FuelPod products. Information is sent to the application through RFID tags, which are located on each pod. This app allows people to maintain and analyze their fitness and nutrition activities. It was also designed to recommend to people what pods should be consumed based on analyzing existing daily activities and nutrition intake. This new technology gives people the tools to maintain and live a healthy lifestyle. The Gatorade Company headquartered in Chicago, Illinois, has decided to develop a different type of smart water bottle that tracks the hydration of an individual. A division of the company, Gatorade Sports Science Institute (GSSI), partnered with Smart Design to assist in designing this device. Both groups came up with a system consisting of GSSI Athlete Service and Testing, Drinkfinity Beverage Pod Technology, Gatorade Hydration Tracking Cap and Sales and Gatorade Hydration Application. The first part of the process tests each athlete, so that specific formulas could be developed for each individual’s needs during a game. The process utilized Drinkfinity beverage pods, which contain a specific formula that was developed for the player. During physical activity, the bottle collects the beverage consumption of an athlete. This information is then synced to the Gatorade Hydration Application by Bluetooth. This app alerts a coach whether a player needs to drink more during a game and also offers hydration recommendations for a player so that he or she can play at their most optimal performance. The full system was first put into practice with Brazil’s national football team during the World Cup. Coaches were able to monitor players by receiving data of each player’s hydration during game time. Gatorade’s new technology changes the way an athlete performs by monitoring their beverage intake. The beverage industry holds a wide variety of drinks available to consumers ranging from water to juices and soft drinks. Substantial research and experimentation goes into creating new drinks that companies believe consumers would be interested in purchasing. 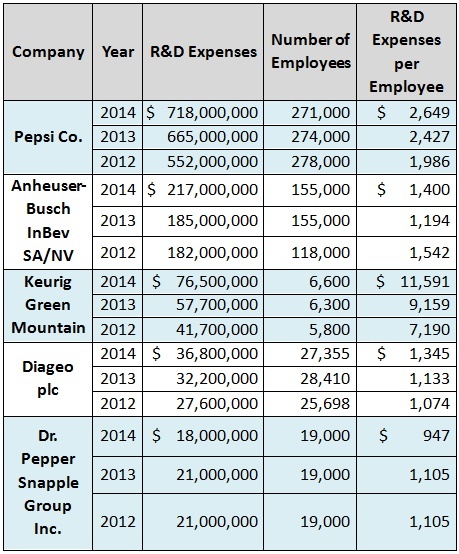 With the utilization of new technology and creation of unique formulas, R&D tax credits are available to businesses who innovate in the beverage industry.